According to Wikipedia, the exact origin of vodka sauce is still under debate. Some say it is a true Italian dish, while others believe it is an American invention from the 1970’s, while others still are convinced a vodka company as a way to promote their product created it. For me personally, I am not too hung up over its provenance. This deliciously creamy and smooth tomato sauce exists in our world today and to whoever was the rightful creator I say, Thank You! 1. In a large sauté pan set over medium heat, melt the butter, then add the onions, garlic, salt, and red pepper flakes. Cook until the onions are translucent. 2. Add the vodka to the pan and cook for several minutes to evaporate the alcohol. 3. Pour the can of tomatoes into a large bowl and gently crush them by hand, then add them to the pan. Reduce heat to a simmer and continue to cook until the sauce has reduced down by a fourth. Remove from heat. 4. Carefully transfer the sauce to a blender or food processer and blend until smooth. 5. Return the sauce to the sauté pan, stir in the cream and brown sugar, and continue to simmer for an additional 10 minutes. Season to taste with salt and pepper. 6. 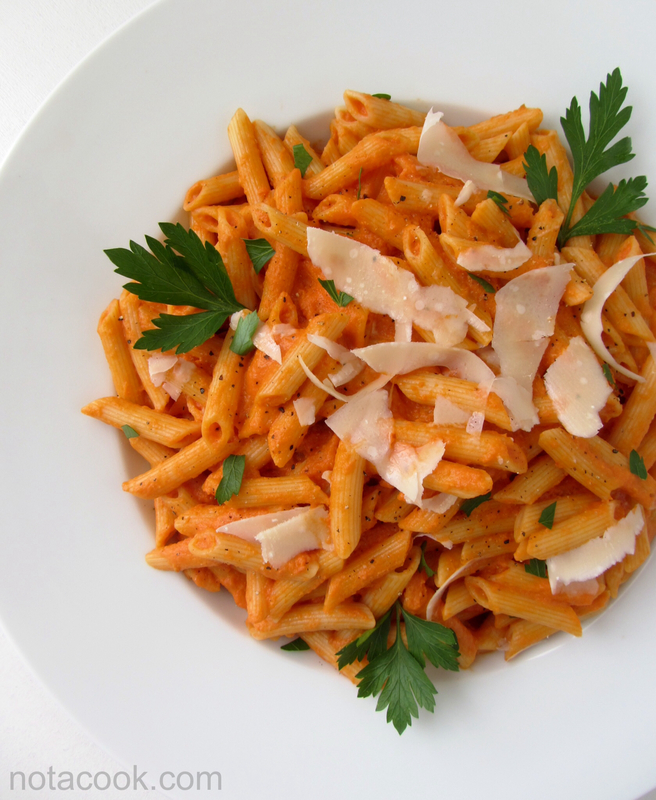 While the sauce is simmering, prepare the penne pasta. Cook the pasta in a large pot of salted boiling water until “al dente,” about 10 minutes. It should be firm to the bite, but not hard. 7. Drain the pasta, reserving 1 cup of the cooking water. Toss pasta with the sauce. Add any of the reserved cooking water if needed to loosen the sauce. 8. Transfer pasta to a large serving platter and garnish with shaved parmesan cheese and chopped parsley leaves. Serve immediately. * Always take care when blending hot ingredients; the heat can build pressure, which may cause the lid to pop off.